For some, the homebuying process may be a “walk in the park,” given the situation that you’ve walked through this park a few times. For others—and probably, most—the homebuying process and the terms that come with it can be extremely confusing. 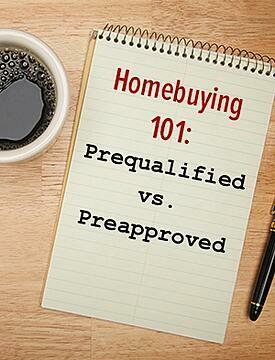 Let’s take the terms prequalification and preapproval, as an example. Many unsuspecting homebuyers may assume them to be interchangeable, when—in fact—they’re anything but. If you’re among the number of residential consumers that are baffled by the difference between the two terms, have no fear. We’re here to help. If you’re in the market to purchase a home, the first step of the mortgage application process is the prequalification. This provides the borrower with an estimate of how much house they can afford and a projection of how much a lender might be willing to lend. Keep in mind, this is only an estimate based on a simple calculation, considering basic information such as monthly income and monthly debt, as reported by the borrower(s). Since the numbers used are based on borrower estimates and no credit report is requested, a borrower’s social security number should never be requested. This is extremely important to keep in mind because if your social security number is being requested at this stage, then all indications point to your credit report being accessed—in which case, your lender is probably moving forward with a preapproval. It should be noted that a prequalification will not carry as much significance when house shopping as a preapproval would because of the lack of information and level of diligence performed to generate a prequalification estimate. For those homebuyers ready to have a more thorough analysis on their financial situation and their home affordability situation, a preapproval may be in order. Since a preapproval is based on verbal information provided by the borrower and information received from a borrower’s credit report, a more accurate and realistic affordability picture can be discerned. With a preapproval letter in hand , a borrower can shop with confidence, knowing exactly how much a lender is willing to lend them, allowing borrowers to seek out homes at, or below, a given price point. Find out what documents you will need to complete your mortgage loan application. Before you begin working with a lender, find out if they provide a prequalification or a preapproval. Since a prequalification is a quick estimate, borrowers with a preapproval letter may receive more favorable consideration when sellers are comparing more sound offers from multiple, competing homebuyers. It’s always good to ask your lender for advice on how to improve your chances when qualifying for a loan.